I have wanted to be an author since I was a child. I have put in quite a bit of effort towards that dream. The thing is, my other dream was to be a wife and mom. That dream has come true! Being wife and mom is my number one job and I really love it! However, writing is my “me time”. It is a hobby that has grown into a business. It is a real business now. It has been an amazing experience over the years! I have been blessed to meet a successful writer, Danika Cooley, in person. She is a kind person and an amazing author! She has been such an encouragement to me in my endeavors to juggle my first calling as wife & mom with my second calling as a writer. I am excited that my dream to be a published author feels within my reach! I hope to author a book in the not-too-distant future! I am currently reading Danika’s newest book When Lightening Struck! to my children and we are really enjoying it! I will be giving you a complete review of the book soon! Meanwhile, I have this great Author Interview with Danika to share with you! If you an aspiring author, you just might find some amazing tips included! 1. What inspired you to write When Lightning Struck? I absolutely love Christian history. I think that understanding our family history is vital to understanding the way God works in history, and to being able to understand the current trends in theology–the same heresies that the Apostles addressed have plagued the Church throughout the last two millennia. As the “Father of the Reformation”, Martin Luther is a particularly fascinating and important figure in the history of the Church. Also, his story is exciting–he lived in the time of castles, princes, and knights; he risked his life for the sake of the Gospel; and he became an outlaw, was kidnapped, and more. 2. What was your main goal in writing When Lightning Struck? I wrote When Lightning Struck! so that young people will have the opportunity to learn about an incredibly important figure in Church history–and about theology–in an engaging manner. Really, I wrote it with my two middle school boys in mind. I wanted to make Christian history come alive for them. 3. Which part of researching When Lightning Struck was the most personally interesting to you? 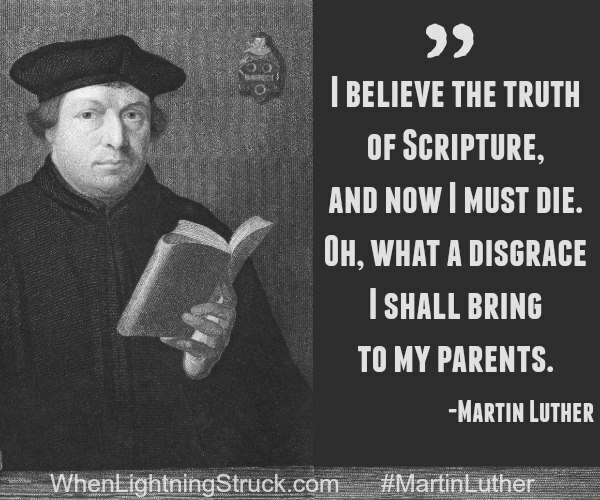 We have so much information about the stories Martin Luther told about his life, that I really enjoyed finding those stories and incorporating them into When Lightning Struck!. It was also really important to me to get the theology involved in the story correct, and I found that aspect of the story fascinating. 4. What did you learn from writing When Lightning Struck? My research notes are about three times as long as the book! I learned so much about Martin Luther, the Renaissance Popes, the papacy, and the structure of medieval monastic orders. In order to tell the latter parts of the story in which the Protestant leaders were debating over the manner in which Protestants should live out their faith, I really had to study quite a bit. 5. What are you reading right now? What authors (living or dead) have influenced you most? Right now, I’m reading Ulrich Zwingli by William Boekestein, Church History in Plain Language by Bruce L. Shelley, Systematic Theology by Wayne Grudem, the books of the prophets in the Old Testament, and a number of books with my boys for school. Reading is definitely one of my favorite parts of my work–I read about a book a week, with bigger works on the side. 6. What was the book that most influenced your life — and why? 7. Do you have a certain writing space, somewhere you go “just” to write your books? An office, a lake cabin, a hotel? What do you love about that space? How does it inspire you? We have a library that I love to work in late at night, after everyone is asleep. It’s nice to be surrounded by biographies and great works while writing. Also, I just really love the room. 8. Is there anything you find particularly challenging about writing a book? 9. Did you always have a talent for writing, or is it something you wanted and needed to work harder to achieve? 10. With all of the duties that you juggle, when do you fit in the time to write? 11. Is your writing style different now than it was when you first began? In what ways have you grown in your writing? 12. How did you get your start in writing/getting published? 13. What do you recommend for others who are getting started? It’s a good idea to find a local writer’s organization, and learn about the business. I think writing for magazines is a clarifying process, which I highly recommend. Also, if you want to reach people for Christ, writing for magazines can really extend that reach. 14. What would you say to a young person who aspires to be a writer? What advice would you give? Also, what would you tell his/her parents in order to help them be supportive in their child’s efforts to pursue writing as a career? 15. Would your advice be any different for an adult who would like to break into the business? How? 16. What else do you want readers to know? Consider your likes and dislikes, interests and hobbies, your favorite ways to relax — whatever comes to mind.